It is one of those subjective truisms that a person becomes a good writer sometime after writing their millionth word. I don’t know if the truism is true or not. I should like to think that my writing was good many hundred thousand words ago. 🙂 I won’t deny, however, that the writing in my first published book, Fidelis (156,000 words), is not as good as my writing of the second book, Spero (165,000 words) , and as I continue to write the third book- Caritas (as yet <50,000 words)- I feel like the writing is better still. Here’s a bit of a no-brainer that was years in the making… all of the published books and short stories I’ve written, listed in one place: Here. To date, these include my Birth Pangs series, my pro-life book, and two collections of short stories. Some are available only in digital format while others are in print. Book 2 of my Birth Pangs series is due to be released on October 20th, 2008, in hard cover. The name: Spero. I am very pleased to be able to release the cover image, designed by my friends at SojournerDesign. Check it out. 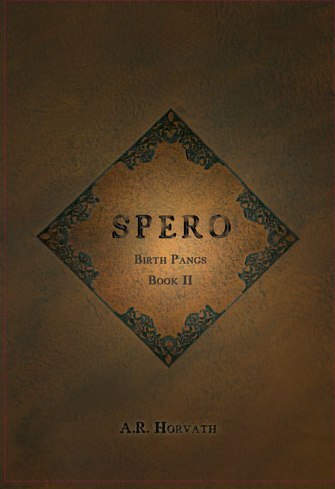 I am very pleased to announce that book 2 in the Birth Pangs series, Spero, will be released in hard cover on October 20th, 2008. The soft cover will be released around Thanksgiving, 2008. I am very pleased to make available an extended excerpt of the book. You may download it below. Feel free to pass it along and share it! Review copies are available. Email me at author@birthpangs.com. Please provide details about the venue that the review would be published in. Review copies can be purchased by fans for a limited time through this site.